Former Team New Zealand design chief Laurie Davidson this morning denied allegations made by Sean Reeves, the former TNZ lawyer headhunted by OneWorld, that Davidson stole TNZ’s IACC 2000 designs with the intention of using them for his new employer, the OneWorld America’s Cup 2003 challenge. 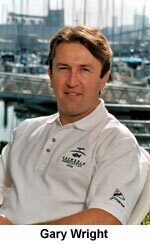 The case concerned is a counterclaim made by Reeves against OneWorld after the Seattle-based syndicate issued a writ against him for trying to sell $6 million of Team New Zealand secrets to the Oracle Racing syndicate, based in Ventura, California, through his friend Chris Dickson. In a report by Wayne Thompson in the New Zealand Herald, OneWorld’s Chief Executive Gary Wright admitted “some mistakes” had been made and that they did indeed have measurement certificates for NZL-57 and NZL-60, TNZ’s 2000-generation IACC boats. He went on to apologise “for the disrepute” brought upon the America’s Cup by the affair but insisted that the record must be set straight. Reeves, employed by OneWorld for 11 months as a rules advisor, also alleged that Davidson had passed on colour photographs showing Team New Zealand’s tank testing for the 2000 America’s Cup at Southampton’s Wolfson Unit. Together with the measurement certificates, Reeves alleges these constitute a clear breach of America’s Cup rules. Davidson, one of five former Team New Zealand designers alleged by Reeves to have passed secrets to other syndicates, admitted that after August 2000 he had found the photo album and the measurement certificates in his office, which he conceded was “a hell of a mess with documents strewn around.” He denied that they were of any use to 2003 America’s Cup syndicates and denied passing them. Davidson said he was returning the photographs to Team New Zealand’s base and dropped into the OneWorld office on the way, leaving the album on a coffee table for 20 minutes, and that Reeves must have seen them and misinterpreted the situation. He added that the measurement certificates were brought into OneWorld by Reeves himself and were never consulted during the design process as they had been forgotten about. Davidson – designer of the last two America’s Cup-winning boats – also went on to say he did not steal, would not steal and indeed did not need to steal design secrets. “I could produce lines drawings drawn for Team New Zealand yachts from memory and could guarantee (their accuracy) within a matter of centimetres,” Davidson explained. The America’s Cup Arbitration Panel will adjudicate in four to six weeks.